La joven cantante del género lírico Bella Jazmín, quien causó muy buena impresión en los círculos artísticos cuando visitó Nueva York el pasado año, está de regreso en la gran ciudad — esta vez con intención de continuar su carrera musical entre nosotros. Oriunda de Paraguay, donde ya ha sabido destacarse con la agrupación musical llamada Eley, cuyas integrantes fueron seleccionadas entre 4.000 concursantes en el programa de televisión “Enganchados”, Bella Jazmín de la Guía quiere ahora explorar las posibilidades que ofrece el medio artístico de la bien llamada “Capital del Mundo”. En charla que tuvimos con Bella Jazmín, nos dijo que como primer paso quiere estudiar intensivamente el idioma inglés, pero que también quiere ser parte del movimiento artístico hispano neoyorquino. 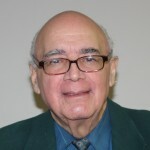 Fernando Campos, born in the Dominican Republic, is a film and theater critic and journalist based in New York since 1961, as part of a family very involved in the arts, being his brother the legendary actor Rafael Campos who worked in more than 50 Hollywood films, among others, with Marlon Brando in 'Appaloosa'. Founder and actual president of Latin ACE Awards, he has been part of the Association of Latin Entertainment Critics since the day of its foundation, December the 12th, 1967. He writes regularly for some of the most important Latin newspapers, such as Impacto NY, Ecuador News in Queens and Manhattan, El Especialito (West Side and Manhattan Edition), and El Especial (online). He is entertainment correspondent for Listín Diario, the most read newspaper in his home country the Dominican Republic, and also contributor to Associated Press historical archive images (http://www.apimages.com/metadata/Index/Olga-Agostini-Obit/2289fbc7cb7945858a03c89e1f33cd80), and has been awarded or honored by journalistic institutions, artistic associations, theaters and TV corporations, as well as community boards, more than fifty times during his more than 60 years of active journalism. He was for decades director and managing editor and editor-in-chief of such magazines as Canales and Temas. Featured at the Marquis' Who's Who in the World (https://cgi.marquiswhoswho.com/OnDemand/Default.aspx?last_name=Campos&first_name=Fernando), Mr Campos is probably the most prominent figure of Latin journalism in the US and one of the most important journalists of Latin America.